If the strike price is at- or out-of-the-money the premium is all time value. Another basic principle is that time value decreases as we approach expiration Friday. Unless the strike price is deep, deep in-the-money we would expect a decent amount of time value if the contract has 3 weeks remaining until expiration Friday. The dividend ex-date is important because that is the date the owner must hold the rights to the stocks to be eligible for the $0.55 dividend. April 1st happens to be the next trading day after March 28th because of Good Friday and then the weekend. 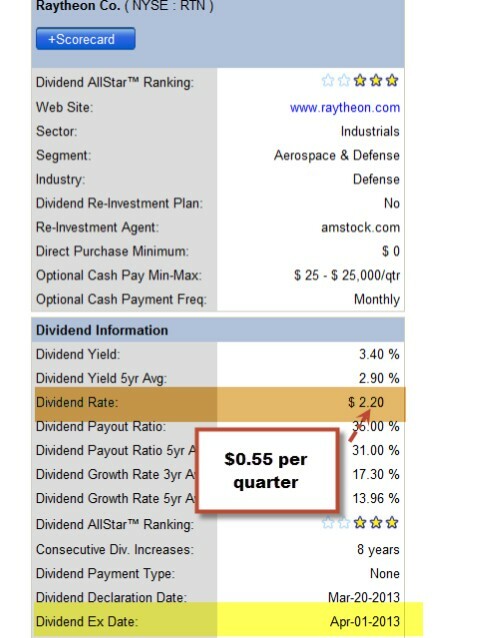 Now, when a dividend is distributed the value of the stock decreases by the amount of the dividend, $0.55 in this case. Therefore, the $1.25 option premium for the $57.50 strike was based on a share value of $58.24 ($58.79 – $0.55). Since the market is evaluating RTN @ $58.24, the $57.50 strike is $0.74 in-the-money, leaving $0.51 of time value or about 1% for the 3 weeks remaining. The downside protection of that 1% is $0.74/$58.24 or 1.3%. This makes a lot more sense than no time value remaining with 3 weeks until expiration. Just prior to the ex-dividend date, the options market will value equities based on the current market value minus the dividend about to be distributed. When an options premium does not make sense based on our education and experience we must look for explanations before making trading decisions. There’s one person in the trading business who has talked to more wealthy traders than anyone I know – Tim Bourquin of Trader Interviews. Tim asks wealthy traders everything from the chart patterns they watch, how they follow price and volume and how they manage their trading accounts. He’s also a former police officer so he has gifted interrogation skills. Tim has compiled these 20 Habits from interviews with over 250 full-time traders – many of whom generate hundreds of thousands trading each year. because only those who sign up will get the recording. For the week, the S&P 500 declined by 1.0%, for a year-to-date return of 9.5% including dividends. BCI: Due to the impact of the sequester and now the added uncertainty related to North Korea this site remains cautious in its covered call writing approach favoring in-the-money strikes. We still remain long-term bullish on our economy and the stock market in particular. The Weekly Report for 04-05-13 has been uploaded to the Premium Member website and is available for download. Thanks for adding the scouter numbers. The more information the better. I enjoyed reading your 4/6 blog on Quarterly Dividends using my live example with RTN. I am also trying to better understand ITM covered calls and liked your blog 3/16 on Sample Premium Watch List. Well I decided to track it to improve my understanding, attached file -(SEE BELOW). Well the results are remarkable for the ITM covered calls. Assume you would unwind the WLK now. Also it supports a diversified portfolio, EMN below strike along with WLK in the chemical industry. You may want to share the mid contract results with your members. I sure find it educational. CLICK ON IMAGE TO ENLARGE AND USE THE BACK ARROW TO RETURN TO BLOG. I am reading Complete Encyclopedia for Covered Call Writing and still in the practice phase of covered calls, so I view this report with great interest. 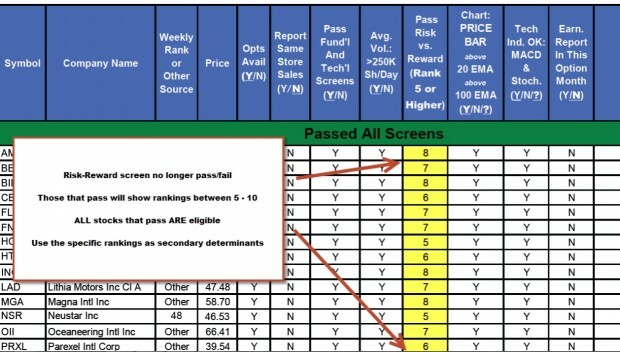 Is this an excel spreadsheet that Robert has made for his own use? Would the formatting and formula’s be something that could be shared? Thanks. Thanks Alan and Thanks to Robert. I think I will really be able to make good use of the spreadsheet. This will be another tool to help me in my covered call decisions. Is it possible for you to give your analysis on a hypothetical trade and what action you would take in a situation where a stock had a huge move and discussing how to handle this type of situation. I would like to use FSLR, First Solar as the example because of the shot to the moon today. I thought it would be good to use as an example because it is happening right now in the market. 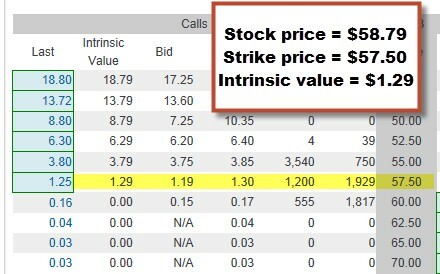 First of all, this definitely does NOT meet the BCI methodology for covered called writing, but I thought if you could use it as an example of where it had been trading, in the $26-$28 range, and if a covered call had been executed for April expiration with a strike price, I would guess I-T-M because of the more volatile nature of this stock. But I’ll let you decide that. 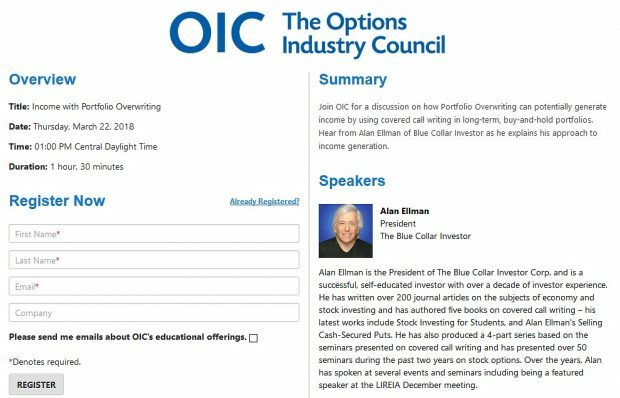 I thought it might be educational if this had happened to an actual stock someone had in their BCI inspired portfolio. This would be part of my education process too because, and like you said, take time to learn and use this strategy. So I thought I would gain valuable insight from you because this eventually could and will happen. An investor would be contemplating, well, do I buy back my calls even though they have gone through the roof to capture capital gains and possible further gains; do I just let the stock be called away and take my premium and move on to the next stock. One thing you wouldn’t do regardless is roll out up or down or sideways because earnings are in the next contract cycle so that isn’t an option. Just to let you know, my personal opinion would be to just let the stock be called away and take my premium and move on to the next stock. I say that because of what happened in this situation, the shot to the moon was ignited by a big time short squeeze and there is a lot of fuel in it. They all of a sudden announced higher guidance. I can understand if this may be difficult to do this, but I thought I would love to hear your thoughts on it, if it is possible. Let’s say you bought FSLR @ $28 and sold the $30 call. A week later the stock is trading @ $38. Now that $30 call will have a premium of $8 intrinsic value + time value. One of the characteristics of a deep-in-the-money strike is that as the strike goes deeper in-the-money the time value approaches zero. Let’s set a hypothetical premium @ $8.10. The real value of FSLR for us is $30, our obligation to sell. By buying back the option that obligation is gone so our shares are in fact worth $38. We now have a debit of $8.10 and a credit of $8 for a net debit of $0.10. If we unwind our total position and sell the stock, we can now take that cash and enter a new cc position with a different security to set up a second income stream in the same month with the same cash…a beautiful thing! To be successful all we need to do is generate more than $10 per contract or more than .3%…should be easy. See pages 264-271 of “Encyclopedia…” for more details.